I got to know Edison and his practice during a month in a 3-storey, former thrift-store. Elsewhere is a strange condition to engage with art in. This “living museum” is simultaneously a space of creative incubation for makers, a site of contemporary community engagement, and a protean archive of stuff that the public come to see and touch and eat and drink up. For a month, I lived with 7 artists - 4 of whom where live-in interns at Elsewhere. Everyone slept in dorms on the second floor, cooked together in the kitchen, and spent their days making art with portions of the museum collection. This includes former residents finished art works. Living there felt like a process of autophagy - what is no longer relevant is transformed, whether that’s a vintage book with problematic views, an artwork that did not age well over the residency’s 15 year period, or compostable scraps from communal meals. After an initial exploration period, residents propose a piece they’ll work on at Elsewhere. Peñafiel was drawn to the large collection of vintage suitcases as a starting point. Born into a creative family in Ecuador, he made his way into music and visual art. He learnt to play instruments by jamming with cousins, and two college-age sisters reiterated their graphic design lessons to him at an early age. He came to the US as a teenager, overstayed his visa but eventually obtained residence status. After enrolling as a business major, he found that it wasn’t aligned with his ambitions. Or morals. He shifted his attention to major in Fine Arts, after a serendipitous photography elective. Earlier works, such as Barrio Alto, and Los Chupasangre coax the viewer into questioning what is real and what is not. Exploring the nature of truth by pushing the limitations of pre-production. Not long after, he began projecting moving images - his stop-motion animations - over objects and spaces. Creating immersive installations that viewers can engage and interact with. As a member of Wild Beast, Peñafiel was recently invited to take part in the artist collectives’ pilot residency program wherein a performing- and a visual artist collaborate on a piece. The installation, And It’s Gonna Be Great!, featured hanging panels of chiffon which created a maze through the 4,000 sq. ft. warehouse. 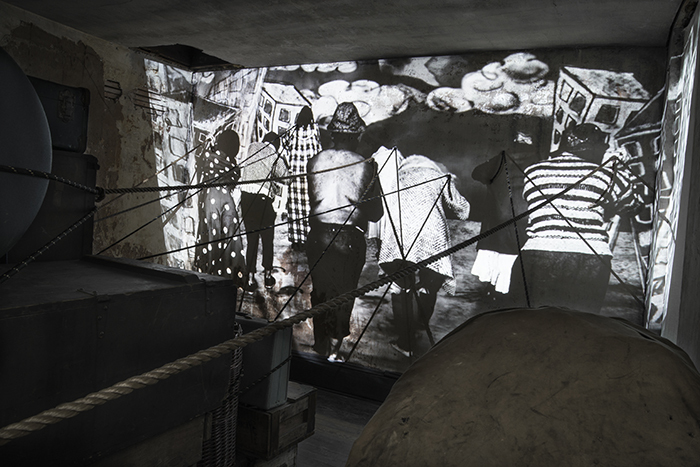 The panels were illuminated, as he tells it, by “(…)animations of walls that shift and move and destroy themselves and deconstruct and construct back and make pathways so that the viewer can walk through them.” The idea being his own version of a wall, albeit one with a permeable membrane participants could cross at without restriction. At Elsewhere, Peñafiel reworked ideas of displacement and migration within new contexts - this time the museums’ luggage collection served as an anchor point. Ni Aquì, Ni Allà is tucked away on the third floor of Elsewhere, down a dark passage way. It’s a fitting location because it requires physical effort to reach. Climbing two sets of stairs and carefully feeling your way down a dim hallway while your eyes adjust to the dark. And his installation rewards tenure. The longer you stay in the space, the more fully you absorb it. The more layers you discover. Initially, your only senses are of the light from a projected film on the left walls, and the accompanying low, uncanny baritones that take advantage of the old wooden floors throughout the building. Peñafiel collaborated with local sound designer and musician, Ellis Anderson, (who created the soundtrack for the piece), to fit the music to the specific visual rhythms of the piece. Providing a physicality to the admonishment of “walking a mile in someone else’s shoes”, the rhythm of the characters walking in the video, quite literally resonate through your feet. These sonic vibrations are absorbed somewhat by a dark mass in the center of the space, which makes access into, and navigation of the interior, something you need to be committed to. The mass is connected to the three screening walls by ropes. These cut and censor sections with their shadows. What you eventually make out, is that the anchoring mass is a collection of boxes, luggage and a single dish-display cabinet inscribed with a Derrida quote. The longer you engage, the more layers you discover. Elements that been meticulously baked into the experience. Whyte’s piece, relocated from the communal dining area on the first floor was incorporated as a sonic disruptor - an overlay. While the installation audio visuals are on a 16 min loop, Look Who’s Coming to Dinner detonates a deep bass drone on the hour, every hour. In homage to the space itself, Elsewhere, is translated into the most fitting Spanish phrasing for Peñafiel. The projection itself spills out from one wall onto the surrounding room. Almost as if the virtual is merging with the physical space. Holes in the wall (from previous residents’ projects) are aligned with the backs of characters heads - a suggestion that some viewers take to it’s morbid conclusion, even though the bodies in the video are eternally struggling forward. At the time of writing this piece, various media of migrant children to the US being separated from their parents and held by the US border control, are scattered through my social feeds. Tucked in between selfies, exhibition announcements, light-hearted fare about weekend activities and advertisements. This makes scrolling particularly jarring: the media following one of those solemn posts (i.e. emergency blankets over small, sleeping children on mats behind chain-linked fences) is definitely going to be less disturbing. Most likely it’ll be so stark a contrast in tone, that the said image of detained migrant children be trivialized. What’s the protocol for that situation? When that contrast in severity is disruptive enough, it forces me to exit the app and think about this new phenomenon for a second. Is this the virtual equivalent of smiling in a selfie at a site of genocide? I don’t know. What I do know is that I’m pretty good at fading out those reminders of a shared-reality, after they infiltrate my virtual experience. Peñafiel is hyper-aware of this societal callous coping-mechanism. The black and white video, and the choppy nature of the frames remind one of the old “classic” cartoon style. He tells me that was intentional: the patterns on the performers garments (stripes, polka dots, plaid), and exaggerated movements help the live action blend better with the animated background. Peñafiel draws from a variety of migratory experiences (Latin America, the Middle East, Continental Africa), each one with it’s own specific political contexts and historical influences. However, it’s the common factors they share, that he extracts for an installation. The more universal the elements in the installation, the more viewers might project their own experiences onto the work - it becomes more relatable as a result. I asked him how he feels about the partially ephemeral status of work created at Elsewhere - especially since he curated an entire space, instead of fabricating an art-object that can be easily moved. He’s also aware of the effect of time on certain contexts. For instance, some of the amassed works by previous residents, have slowly become problematic as attitudes and understandings have progressed. The same will happen to contemporary works to some degree - they’ll be re-contextualized by future Elsewhere residents. We chat about authorship, audience and how artist statements can defeat the entire point of interactive work. He mentions an exchange he had with a viewer, where they bounced ideas back and forth about the installation. For more additional information on Edison Peñafiel’s work check out his Instagram and website.